I am trying to draw a straight arrow from one shape to another, two rectangles precisely. I have an MWE below, but the arrow from rectangle B meets rectangle A at an angle instead of at 90 degrees. This looks like a bug for me. In a strange way if we use ([transform] A) when A is a node, the anchor to, or from, A is calculated before the transformation, and the node A is transformed only afterwards. the anchor from B is calculated, not from ([yshift=-2em] B), to the calculated anchor of A. Here is an illustration of this. In conclusion : We can't transform nodes like this, only "real" coordinates are transformed. UPDATE: Actually ([transformed] A) looks to have a "double nature" : as a coordinate it is the same as ([transformed] A.center) and as a node it is the same as (A). 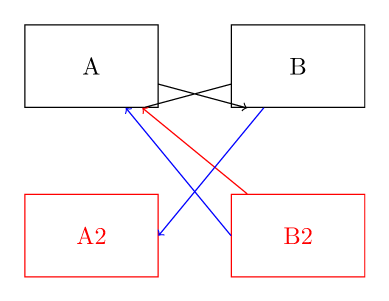 Here is one example that shows this "double behavior" of coordinate transformed nodes. 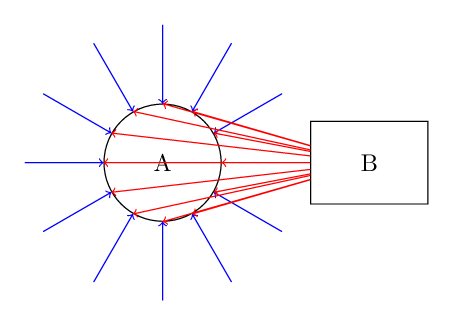 % and then behaves like the node (B) when we draw from it.